As most of you know I am passionate about Health and Development, Nutritional Therapy and Research, so it's natural for me to be excited to share the things that have made an impact on my own life, that of my family and my clients. Please note this will take you to our affiliate site for purchase. Sulforaphane is the latest buss word in the Autism Community. Sulforaphane: Why all the fuss? As of today there are 1942 articles on PUBMED that mention Sulforaphane; 607 that mention Sulforaphane in connection to Nrf2; and 25 clinical trials that are on Sulforaphane. Sulforaphane is a chemical found in brassica vegetables and is especially concentrated in broccoli sprouts and BSE: broccoli sprout extract. Noting the graph to the left… Protandim is 6.4 times more effective than Sulforaphane. THIS IS HUGE!! As for Protandim, there just isn't any comparison. At levels of absorption that are available in humans, the Nrf2 activating capacity of Protandim far exceeds Sulforaphane. Or another way of saying it, Protandim is 640% better at activating Nrf2 than Sulforaphane! The powerhouse of your cells. They generate the energy our bodies need to do their jobs. 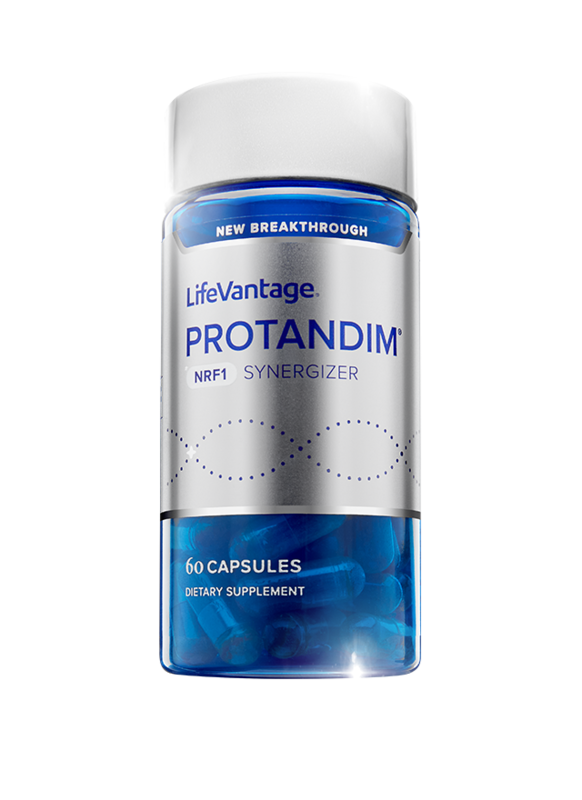 Protandim NRF1 Synergizer, revolutionises health and wellness. Beneficial during times of stress, aids and assists in the maintenance or improvement of general well-being. Reduces free radicals formed in the body. Higher ATP levels increase energy for all your vital organs to support health at the cellular level. Higher ATP levels means more cellular energy—more cellular energy means your body works more efficiently. Means your body functions more efficiently—improves cellular rejuvenation, supports heme production, supports brain function and cognitive health, and supports heart health. Wake up the NRF1 protein to support mitochondrial biogenesis—the creation of new mitochondria. protect the mitochondria you have and promote cellular health. LifeVantage applied the study of nutrigenomics to identify these natural antioxidants, phytonutrients, and naturally occurring coenzymes to activate NRF1 and promote mitochondrial growth and function.